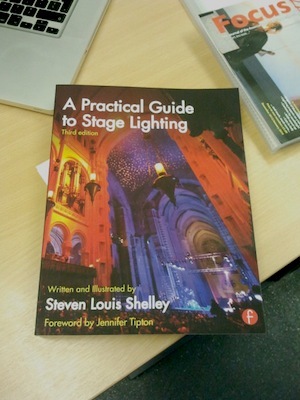 Following the recent publication of the third edition of Steve Shelley’s book “A Practical Guide To Stage Lighting”, On Stage Lighting tackles this enormous beast of a book to see if we should replace our original copy. Shhh. It would be rude to say out loud but, like those of us that no longer tour, this book puts on more weight as the years go by. Originally published in 1999, Shelley’s editions don’t simply get revised with a few more pictures, tarted up or hacked about but actually re-appear like an old friend who seems to have had a few more trips to the buffet table since you last met. This is not a negative situation, in fact the book presents further value in the latest incarnation. However, be warned. At over five and a half hundred tightly packed A4 pages of body text, there is LOT in this book and the sheer volume of professional lighting gold within is more than one person can shovel in a sitting. It also could appear to be too much to face in several sittings. However, we will look at how to deal with this anon. Do Not Buy This Book…..
Just starting out in lighting and wondering about the difference between a Fresnel and a funnel. Do a little amateur dramatics in a church hall and want to decide how to light Gosforth’s Fete with 7 x Patt 45s and 4 hook clamps. Wondering how to make DMX emanate from your laptop for the school disco. Hoping to get something to pick a filter for you. There are other books for this. It’s not that there isn’t some information on the basics here, it’s that this book is completely rammed with stuff that will make your head spin until you have a) a fair experience in stage lighting and production in general and b) have attempted to do a few lighting designs using learning from well-worn guides from Reid et al. In Shelley’s book, “Guide” and “Practical” relate to what I would suggest is a guide to advanced practice for either extremely competent amateur lighting enthusiasts (lighting decent sized shows with a proper budget), stage lighting students and developing professionals. This book could be subtitled “Everything Mr Shelley has ever experienced and thought about lighting in his long and illustrious career.” Slighting ironically, the book contains little asides titled things like Shelley’s Notes and Shelley’s Top Tips when in fact the whole book is an avalanche of practical advice, notes, tips, pro tips, detail. So much detail. This is the value right here, folks. Everything from contracts and interpersonal advice, to calculation and communication and right back down to minutiae of masking and focussing, it’s all here. Somewhere. Luckily, there is an index but also a more practical way to work through this book: via production itself. Using the mythical production of Hokey to present the ideas, Shelley hands out his version of a North American lighting design process by the bucketful presented not only in text form but also by a substantial number of CAD drawings, diagrams, appendices and planning paperwork. The book continues to communicate standards of best practice in Shelley’s own obvious strong areas of modern technical drawing, communication and, again, detail. Shelley comes across as a serial analyst, a calculator and a list maker and his book gives those of us teaching lighting design plenty to beat own our students about the head with in this regard. The Guide contains multiple examples of ways to document and communicate seemingly everything imaginable, a great tool for students looking to understand these important elements. Some of the drawings are for Hokey process itself, many are additional thoughts and ideas on everything from pipe trim heights to focussing booms and nearly all the concepts communicated via drawings are also examined in the prose. A lot of the practical learning to be had from this book is just not in print anywhere else, being the kind of lighting shenanigans that has only so far been discovered through years of doing it. But how to access the learning in all those pages of detail? This book uses the Hokey hook and is laid out reasonably chronologically in terms of lighting design and delivery process. In my view, the first serious read of A Practical Guide To Stage Lighting really should accompany a production of the reader’s own. This makes each piece of detail arrive in a timely manner and be much easier to zone into when, for example, you are having initial meetings or drawing your first draft or going into a focussing session. Once the book has been used in this way once, the geography of this large amount of information can be understood and then dipped back into on future productions. Reading this book from cover to cover should be, initially at least, taken over the lifetime of a production from the first contract meeting to the first night. It definitely is not a book to read in a session, hoping that somehow you will assimilate even 5% of what is presented. If that doesn’t take the equivalent of Shelley’s 40+ years in the business, it will certainly take a number of productions of the reader’s own. So, what are you waiting for. Pick up a shovel and make a start. You can pick up the new Guide on Amazon UK HERE or for our many readers across the pond at Amazon in the US HERE. A PDF version of this review can be found at A Practical Guide To Stage Lighting – Steven Shelley PDF.